We’re rounding the final turn in our spring fundraising campaign, and thanks to hundreds of generous donations to Streetsblog and Streetfilms the finish line is within sight. Just $3,500 in donations this week and we’ll reach our goal of raising $30,000 by June 1. Your support enables us to produce high-impact content making the case for livable streets and green transport. So if you haven’t given yet, no more holding back — now’s the time to contribute. The pledge drive ends Friday at midnight. 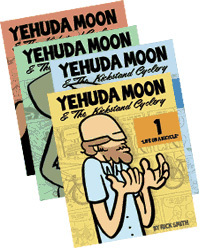 Our next giveaway: Three lucky supporters will win a complete set of Yehuda Moon comics. For the uninitiated, Yehuda Moon is the all-weather cyclist and crusading bike shop owner heading up a cast of characters who tell stories from the streets and bikeways of northeast Ohio. The comic is the work of Rick Smith and Brian Griggs, and it’s full of brilliant, universal insights into bike culture. Readers who give $50 or more to Streetsblog SF will also be entered to win a new PUBLIC city bike courtesy of PUBLIC Bikes. Only three days left to put yourself in the running. Many thanks to all our readers who contributed to this pledge drive and supported our work. One more push and we’ll reach our goal.